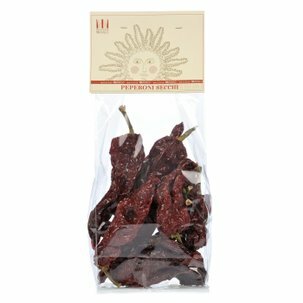 The Mirogallo Sun-Dried Tomatoes are the result of a simple and artisan process: 90% of the water naturally present in the tomatoes is extracted in order to preserve the high content of vitamins, mineral salts and other organic substances in order to keep the flavours and nutritional properties intact. And to conserve them perfectly, only optimal extra virgin olive oil, wine vinegar and a bit of oregano is added so you can always enjoy the flavour of the best summer tomatoes. Ingredients Dried tomatoes, extra virgin olive oil, wine vinegar, oregano. For more information on product labels, please contact our Customer Service department. The information on the labels of the products may vary for reasons beyond our control, therefore, there may be discrepancies between the information on the site and that on the products delivered. Please always check the information on the product before consumption or use. The artisan laboratory of the Masseria Mirogallo farming company was established in 1998 in the Chiese Rupestri park of Matera, a beautiful city declared by UNESCO as a World Heritage Site. 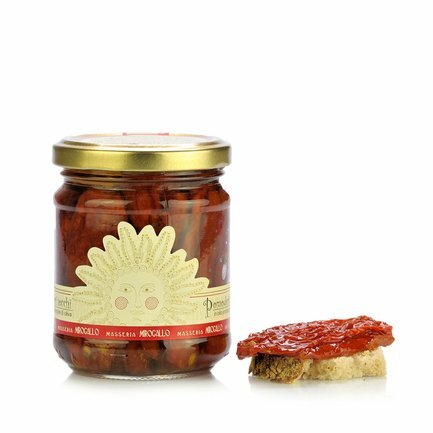 They have a very precise intention: cultivate, conserve and help people learn about the fantastic Lucania products, deriving from the strong farming tradition that is deeply rooted in the territory. The aspects that most characterise the Masseria is its attention to quality instead of quantity, the combination of innovation and tradition, processing rigorously by hand and the constant search for old varieties to be rediscovered. All the products are conserved with the addition of very few ingredients, with the full respect for the ingredients offered by nature.